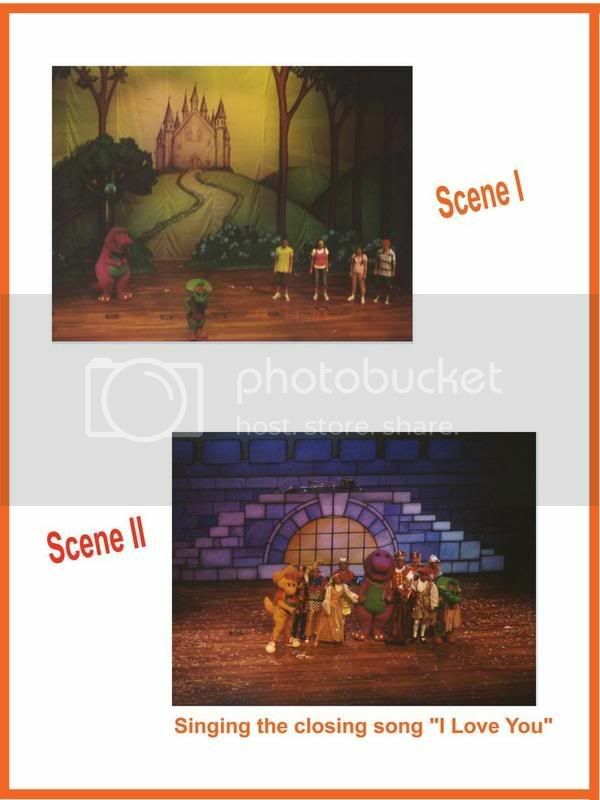 We took Princess to watch Barney & the Musical Castle Live in KL Convention Centre at Plenary Hall. Poor Lil Darien had to taken care by my mom. Initially we thought of bringing Darien there but he’s only 12 months old and we’re afraid that he’ll demand this and that. So it would be the wiser to live him with my mom. The whole journey, Princess was asking where is ‘titi’ (little brother). We explained to her that her brother is too young to go. Next time when he’s older we’ll bring him. She seemed understand and nodded. The next moment, she asked again. It was endless. 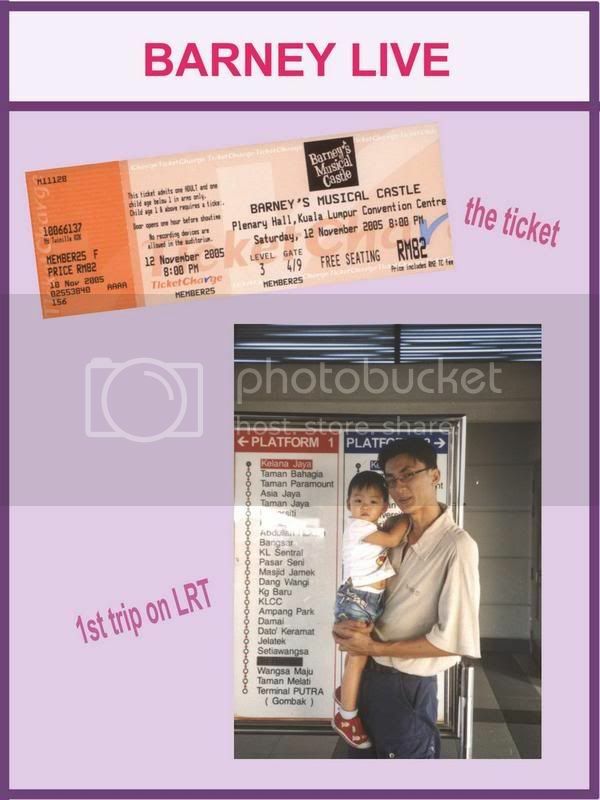 We took LRT .. thinking that its a 1st time ride for Princess and Daddy. It had been years since the last time I took the LRT. It was a bad choice this time round. I had forgotten we had to stop over in so many stations and Princess was scared the whole journey through. We had to carry her in our arms. Carrying a two year old is no joke …. Boy! She’s heavy. She’s a timid little girl. Upon reaching the concert hall. Everywhere was pasted Barney this and Barney that. Our girl got so excited. We had been telling her about this concert a few days back. And now here we are … Barney the purple dinosaur! When entering the concert hall, I told her .. “see there at the stage, Barney will come out from there later”. Then she told me .. “I don’t want”. Oh my Gosh! I was like what does she mean by she does’t want? She was mad about Barney. Oh Boy .. this is going to be a challenge. Daddy tried to pacify her telling her it was ok while I booked for seats. We bought the cheapest tickets so the seatings were free. I was thinking of getting the $130 ticket but was thinking what if she’s scared then we’ll waste all the tickets. So I chose the cheaper ticket. She asked Daddy to go to the highest seat. Poor poor Daddy. Finally, when the show was about to start, she decided to sit where I was sitting. Overall, she enjoyed the show. Being enclose like this is something new to her .. so I think it takes time for her to adjust. In the end, she ended up with two of Barney’s friends, Baby Bop and BJ. She already had Barney lying around at home. This entry was posted on Monday, November 14th, 2005 at 3:01 pm	and is filed under Travel & Fun. You can follow any responses to this entry through the RSS 2.0 feed. You can leave a response, or trackback from your own site. I heard it was really good. yeah it was quite good. we as parents actually enjoyed … hehe. Hihi, just drop by here! and of course, NiCe to meet you! mom2ashley: i remember letting denisha watch her 1st barney when she was 6 mths old. she learn a lot from the show. She do hugs & kisses with us. So cute.